We’re kind of boring. We eat Mediterranean once or twice a week, usually in the form of a mishmash of spreads, vegetables, and chickpeas wrapped up in all the pita you can possibly stuff in your belly. Hello, stretchy pants. One evening, I made the Roasted Chickpea Tabouleh Salad from our cookbook but added some fresh red pepper, roasted broccoli, and sweet potato. I love making old things new again. The other amazing thing about this recipe? You can pick up 90% of the ingredients at the farmers market. Grab a beautiful head of broccoli, a sweet potato or two, some fresh dill and garlic, and a bell pepper and you’re pretty much set. All that’s left are chickpeas, hummus, lemon, and spices. I love 30-minute meals that also happen to have extremely basic, approachable ingredients. 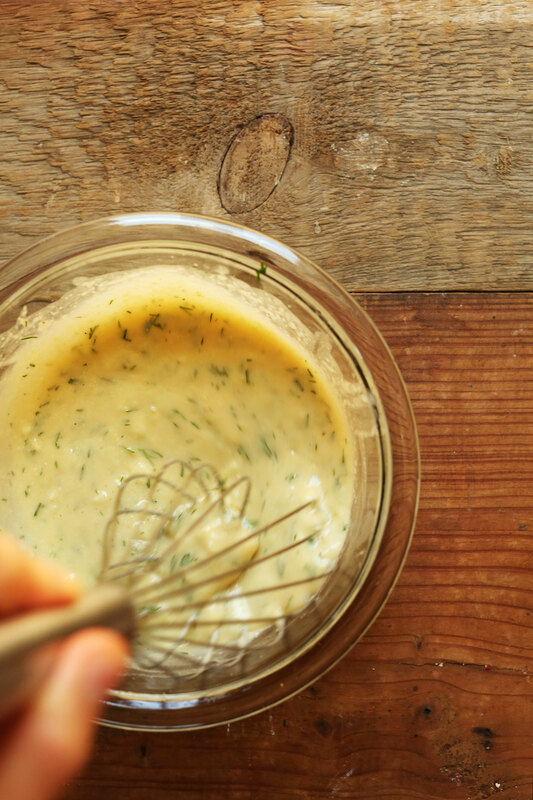 The dressing, which has become a classic on the blog and in our home, is my go-to 4-ingredient Garlic Dill Sauce. 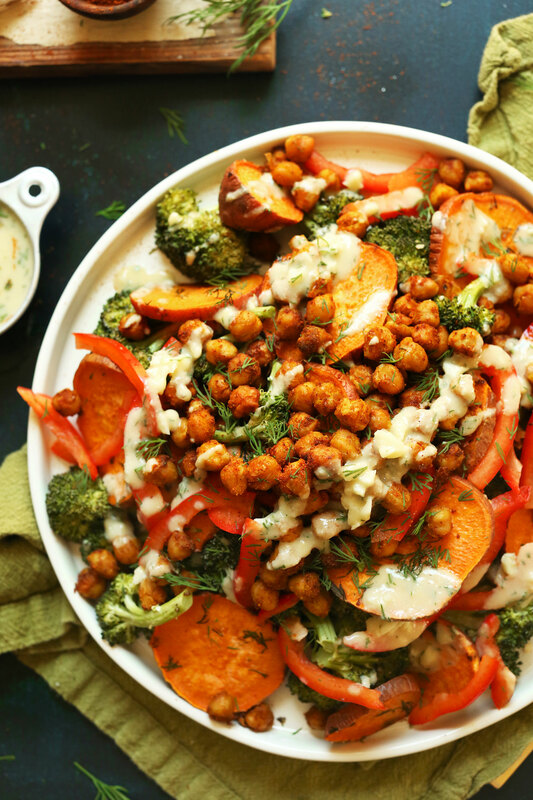 It’s made with hummus, garlic, lemon juice, and dill – ingredients you likely always have on hand, which makes it so easy to make up a batch and put it on everything throughout the week, from Chickpea Shawarma Dip to Mediterranean Baked Sweet Potatoes to this salad. This makes a delicious weeknight meal when you need something nourishing on the table fast. It also makes a great lunch and would even pack well as a picnic meal or post-workout snack. If you try this recipe, let us know! Leave a comment, rate it, and tag a picture #minimalistbaker on Instagram! We’d love to see. Cheers, friends! 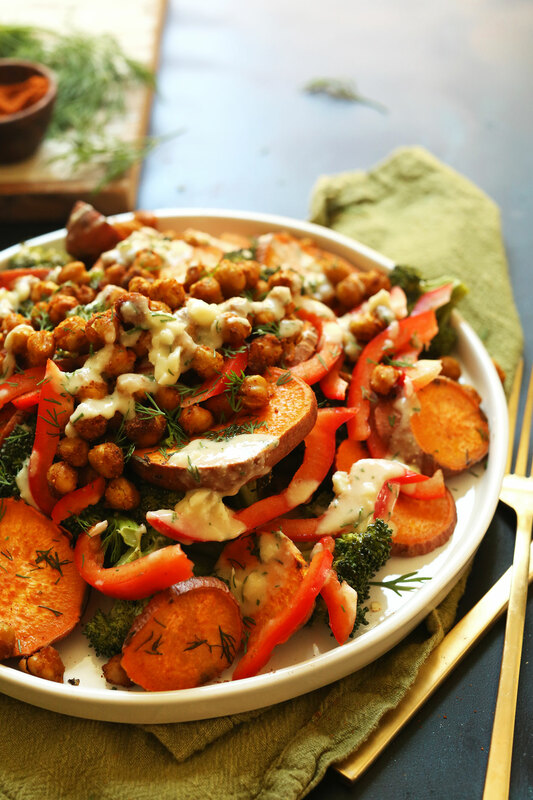 A satisfying, plant-rich entrée or side with roasted broccoli, sweet potato, and chickpeas. Topped with a creamy 4-ingredient garlic dill sauce. Preheat oven to 375 degrees F (190 C) and line two (amount as original recipe is written // adjust if increasing batch size) baking sheets with parchment paper (or grease lightly). Add rinsed dried chickpeas to a mixing bowl and season with oil, tandoori spice*, coconut sugar and salt. Toss to combine. 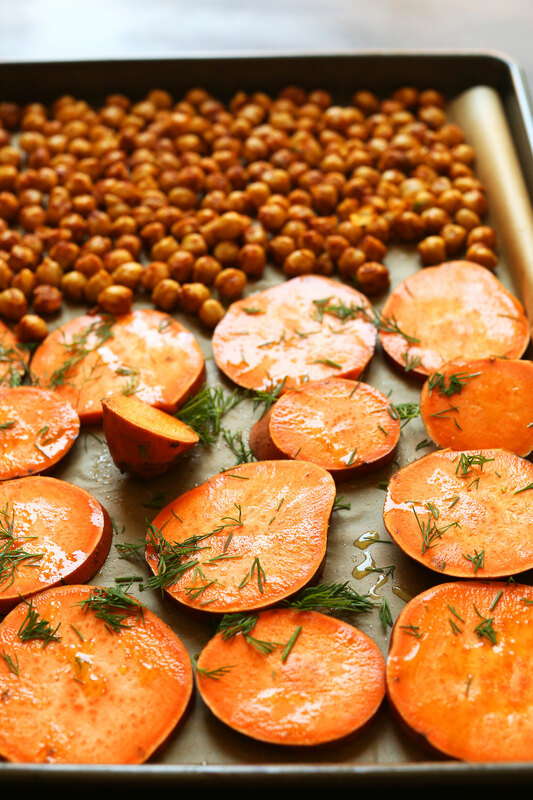 Add sweet potatoes and chickpeas to one sheet, and the broccoli to another. Drizzle the vegetables with olive oil and sprinkle with salt and pepper - toss to combine. Sprinkle with dill (optional). Then arrange in a single layer. Bake both for a total of 20-25 minutes, rotating the pans once near the halfway point. You can flip the sweet potatoes over to encourage even baking, but it's not necessary. You'll know the broccoli is done when it's golden brown, the sweet potatoes will be tender, and the chickpeas will begin firming up and taking on a slight crunch. Set aside. While vegetables and chickpeas are baking, prepare dressing by adding hummus, garlic, dill, and lemon juice to a small mixing bowl and whisking to combine. Then add only enough water to thin until pourable. Set aside. To serve, divide vegetables and chickpeas between two serving plates and drizzle with dressing, or serve on the side. Best when fresh, though leftovers keep stored separately for 2-3 days in the refrigerator. Enjoy leftovers slightly chilled or at room temperature for best flavor/texture. *I buy my tandoori masala spice blend from Whole Foods (whole foods brand). But you can easily make your own by mixing: 3 Tbsp ground cumin, 2 Tbsp garlic powder, 2 Tbsp smoked paprika, 3 tsp ginger powder, 2 tsp ground coriander, 2 tsp ground cardamom. Multiply as needed. Wow! Really easy and super delicious. I’m going to remember the dill-hummus sauce because I want to put it on everything. I ate it all in one helping (don’t look at me that way), but when I make this again, I might split it up and make a mediterranean tempeh bowl. Thanks again for the recipe. Super delayed comment: This recipe is super easy and straight forward, one of my go-tos! Thanks making eating delicious vegan food that much easier!! Oh my goodness! Made this tonight, exactly as the recipe calls, and was so yummy, easy, and satisfying. Definitely going to make again. Hmmmm just made it and it was sooo good! I sprinkled a bit (maybe a lot) of dukkah on top of it! So easy and delicious! Skipped the red pepper and it was still excellent. Do you think a puy lentils would work instead of chickpeas? I think that could work, though it would yield different results in flavor and texture! This was absolutely lovely, thanks for the recipe! I’ve made this 3 times, love the recipe, and have gotten lots of compliments on it. Thank you!!! This looks and sounds INCREDIBLE!! Could you substitute the dill for basil???? We are out of dill and I really need to use up my broccoli and I have everything else…. It will change the flavor, but yes. Parsley would be the next best, then cilantro, then basil. Every time. Even was able to get my boyfriend wanting seconds. Garlic, dill, and all the roasted veggies. Tonight I swapped the pepper for zucchini and served it over spinach, with hemp hearts. And, to be honest, I put all the sauce on my single portion. I double that almost every time when two of us are eating! Yay! So glad you and your BF enjoyed it! This recipe is my absolute favourite! It’s our go to comfort food for my family. We love it with the peppers raw and crunchy. Simple, filling, healthy and all these vegetables go so well together with the chick peas. Love your version of the spice mixture. Thank you! I’ve made this dish twice in the past 2 weeks. My meat-eating mate says it is wonderful and would like to keep it on the rotation! I was surprised at how filling this salad was. I didn’t need to serve anything else with it (aside from a bottle of wine) and we felt full, nourished and totally satisfied. I’m not a huge fan of dill, so I left that out of the veggies. I did use the optional red pepper and roasted it with the broccoli, it was colorful and delicious. Very pleased with how the chick peas came out, very crunchy. For the sauce, I made batch 1 as directed (dried dill vs. fresh). It was REALLY garlic-y although my husband said it was fine. I cut the dried dill and garlic down on the second batch; while we may not ward off as many vampires, it was still very potent and flavorful. Thanks Dana, the bulk of my cooking in the past year or so has come from you and I feel 100% better for doing so!! This was great! I added some quinoa to it and it was a hit. Needed to use up some broccoli I had on hand but also needed something that didn’t take a lot of prep time. Ended up making this. Love all of the various flavors. Yummy. Will definitely be making this one, again. I have made this before and the whole family loves it! What would you suggest serving alongside this to increase the fill-your-belly factor? I think quinoa cooked in veg broth would be great with this! Extra chickpeas, or maybe a crusty bread with garlic-infused olive oil? I just made this! aaaand there’s nothing left anymore…it rocks baby..i feel like i’ve eaten lots of meat, you rock! I have made this a million times now! It is my go to healthy lunch meal during the week. The flavors are incredible and you can also just use whatever leftover veggies you have on hand. Truly delicious – thank you! Just made this. Good flavor combinations but it wasn’t clear what to do with the sweet potatoes so I just sliced them per the pictures. One of my favorite recipes from you! It’s so refreshing and delicious. It’s also a very versatile recipe; I typically make it when I have an assortment of veggies to use up. This was so GOOD! Put veggies on top of some butter lettuce, and drizzled on some of your simple tahini dressing (tahini + garlic powder + salt + water + some lemon juice). Made it the night before and it was a perfect workday lunch. Love this! I have discovered that ALL your recipes are remarkably good. Hooked! This is one of the easiest and most tasteful meals I ever made! The first time I left a comment on any recipe ? Thank you! I made this sans red pepper and dill, and it was still delicious. Even the non-vegans in the house liked the unique variety and play of flavors. Bravo! Used tarragon instead of dill because it was all we had on hand. Recipe is so easy the boyfriend made it. Tasty! Thanks for dinner! This recipe is a real winner! Hubby & I loved it! I doubled the sauce as we like it juicy… it was delicious, a perfect stay-at-home cozy dinner! The raw garlic prevents you from going out anyway ? Okay, so this is pretty much my new favorite website. So thrilled to make a million of these recipes for me and my 2-year old. We live in Paris half of the year, as well, and it can be tough to find all of the “speciality” ingredients that live at Whole Foods. So, the approachable ingredient/fresh market philosophy really works for us. Thank you! Wow. Tried this few weeks ago because I had some leftover sweet potatoes and broccoli and we have now made this for meal prep the last two weeks. Reheats well if you keep the sauce separate. I also found you can put everything on one big pan and it comes out fine. I made this last night for dinner, which was actually my second time this week alone trying one of your recipes and it did not disappoint! I used Garam Masala instead of Tandoori for the chickpeas and after they were baked I had to stop myself from eating so many before actually getting them on the plate. My sweet potato was still practically uncooked after 25 minutes (sliced each in half) but nuked them in the microwave for 5 minutes preparing the hummus sauce and they were perfect. That hummus, dill and lemon sauce was amazing. It took everything in my power not to take a spoon and eat it straight out of the bowl. The dish came together wonderfully and it was so delicious. I’ll be making this over and over again! I made this tonight and it was SO GOOD! HO-LY Guacamole it was delicious! I had purple yams on hand and roasted the peppers. It was beautiful! I look forward to trying to follow the recipe a little more closely next time. We were out of lemon somi subbed lime and couldn’t find my tandoori so I improvised with smoked paprika. This is going into the recipe rotation! They would probably get really dry. 10/10 would make again and again and again. Delicious! What a delicious recipe! I left out the garlic from the dressing, my husband and I ate it all! I have to say, I’ve made this at least 5 times now. It is one of my go-to favs now! And the leftovers, I eat cold the next day and are so good! I made this for dinner and it was so easy and so filling and so yummy!! Thank you! On my first attempt, I doubled the recipe because the flavors spoke to me. That was a good choice. I’m excited for lunch leftovers. Thanks for a great recipe! This meal is delicious, especially with that dill sauce! This made for a filling and healthy dinner! We loved it! I’ve made this recipe twice now and have to say, it’s definitely one of my favorite dishes ever. I prepared it as part of a culinary challenge with my fiance (we have to get super creative to make cooking after a long day enjoyable!) and this garnered a 10 out of 10! The fact that it’s super easy and that I always have these ingredients on hand makes it that much better. Thank you for sharing your recipes! This recipes is definitely rated G.A.F. Incredibly easy and flavourful, a new Monday night dinner in our house! Thank you so much for all the delicious recipes! Last week every supper we made was from your site or cookbook, what would we do without you!? My boyfriend and I stuffed this in a whole wheat pita and it was delicious. Having it again tonight! Thank you! Okay this looks like heaven! I’m clearly in the minority, but I made it tonight and it looked beautiful! We love chickpeas and sweet potatoes, so I thought for sure it would be a winner. I roasted the broccoli and red bell pepper as well. But the beauty of it was where the love affair ended. It was quite dry, even adding more dressing didn’t help. The flavors were good, but the mouth-feel wasn’t good at all. Sorry, I probably won’t be making it again. didn’t have fresh pepper and subbed the tandoori spice for a pre-made nandos mix out of laziness – fantastic results. added homemade garlic rosemary ciabatta slices which were yummy but unecessary (neither of us could finish it all!) – still getting using to this veggie dinner thing. my first comment but 5th recipe, thanks dana for your innovative and delicious dishes, always so flavourful. the nutritional values are really useful (and key for getting my gym-bunny partner on board with plant-based eating). we both loved it!! Wonderful recipe…easy to make and delicious! This is so amazing – I’ve made it twice in the past week! Made this. Love it. Crave it. Thank you!! The combination of the dressing, fresh dill, and the spiced chickpeas is amazing! I didn’t have any broccoli so I made it with roasted cauliflower and it turned out great. We’ve already made it twice, it’s just so good. Such an easy, quick weeknight meal. Thanks for the yummy recipe, Dana! 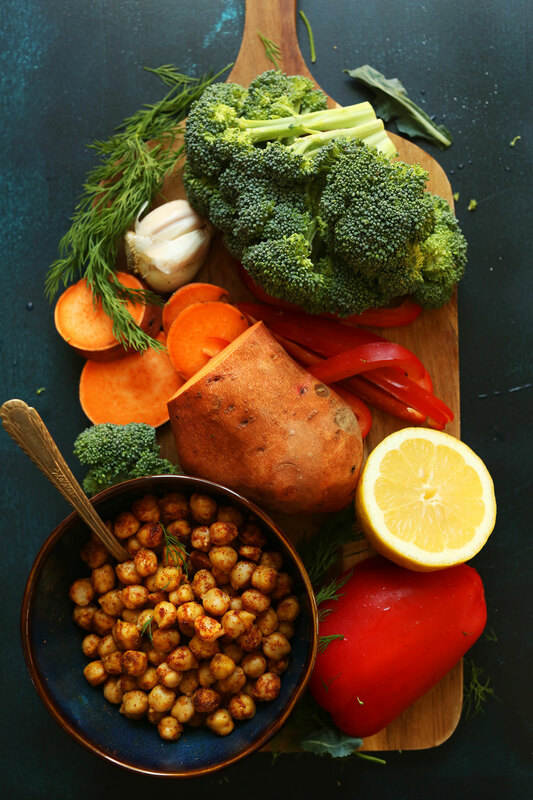 Sweet potatoes and chickpeas taste delicious together–they are great in salads, tacos and curries! This is such a beautiful recipe! I made this last night – DELICIOUS!! Thank you for your simple, wholesome and tasty recipes! Great meal! Super easy and quite flavorful. This recipe is so so amazing!! I was so keen to try this out and it did not disappoint :) The chickpeas and the garlic sauce are the stars of this dish! I’ve now made this recipe 2 times and I can not get enough. I didn’t have any sweet potatoes so I used zucchini instead and it was amazing. About to make it again with sweet potatoes. I’m glad I stumbled upon this site a month ago, it has made being vegan so much easier and stress free. Hi Dana! I’d love to split this into fourths and have it for lunch. How long do you suppose it keeps in the fridge? Well, it’s best when fresh, but I think 2-3 days! Hooray! Success! It worked well as a lunch item. I let the broccoli, chick peas and sweet potato each cool completely before assembling them in mason jars with a small amount of sauce on top. I made EXTRA sauce because I’m obsessed with hummus and garlic and dill and added it to my tin tuna and mixed greens. Also, I made it for a pot-luck that was also a bake-off featuring a lot of sugary-sweet treats. I thought you would be very complimented to know that it was the only item that was completely wiped out in less than one hour. Hi! Im thinking of doing the same thing, did you re heat it when having for lunch or eat it cold? I made this yesterday and today. No, I didn’t make it twice, it took me two days to make it. I am the worlds most disorganized person! Anyway, it was very good. It had a lot of favors and they all went nicely together. I think this would be a great first time dish for someone new to vegetarian meals because omnivores that I know think they simply cannot survive without meat. This dish proved you not only can survive, but thrive! It is very satisfying and was sweet to my tastes so no need for dessert. Some folks must have dessert, and I think with this meal, that would not be necessary! Good job! This was a really tasty dish. Thanks! Thank you for this recipe! I was looking to have something different for dinner and this was definitely different! When I make it next time, I will stir fry the broccoli and brown it when the water evaporates because it becomes very dry in the oven and almost impossible to chew. But I like the combination of all the ingredients. And it looks beautiful, too! Thanks for sharing! Perhaps the broccoli was overcooked? I’m going to chime in on this because I was super obsessed with oven roasted broccoli about two years ago and sometimes it would be too dry and other times it would be succulent and amazing. I used to buy all my produce, and all my groceries at Trader Joe’s. I still shop at TJ’s but I found that the co-op has the freshest vegetables available. I think freshness is the key here but there could be another piece to this puzzle: oven temperature. Maybe double check the temperature by using a separate thermometer in the area of the oven where you’re cooking the broccoli. Keep in mind that the closer to the top, the more intense the heat is as heat rises and the top of the oven radiates heat. Everything came out very tasty, by the way! Made this for dinner last night, it was excellent and quick to make! After a long day it was so nice having something delicious, healthy and simple to put together. We will definitely be making this one again! first time I comment here, although I’ve been trying out your recipes for quite some while now! Great idea! Will add to the list! 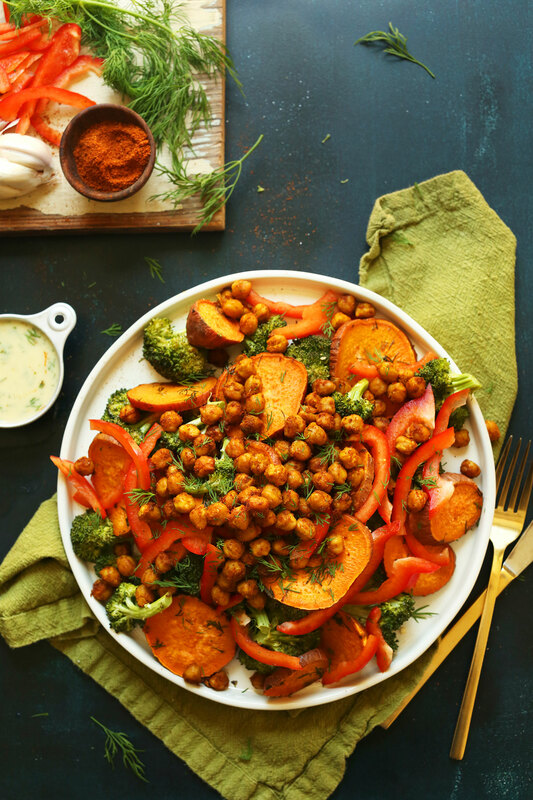 Love chickpeas and sweet potatoes! This is one of my favorite quick and easy recipes to date!! So healthy and filling, toasty and satisfying, and flavorful to boot. As a medical student with practically 0 extra time for meal prep, I would recommend this recipe to anyone with little time to spare! This looks so amazing and fresh! Is tandoori masala spice the same as garam masala? Pretty much depending on which blend you buy. But double check whichever blend you buy to get the flavors as spot on as possible. Cooked it last night. So easy. Even my kids enjoyed it although the raw garlic in the dressing was quite strong. I’d be tempted to knock it back to one small clove if cooking for kids too. As an Indian who uses these spices regularly – no they’re not the same. Tandoori spice is a mix of a larger number of spices as compared to garam masala, and the taste they give are quite distinctively different. However, for this recipe i’m thinking both should work, since you wouldn’t use any other distinct spice with it. Thanks for sharing, Padmini! That’s super helpful. The Garam Masala would add a totally different flavour. Nothing boring about this one and that dressing! Love this one! This was great! The dressing was easy and had an lemony kick. I purchased too much broccoli at the Farmer’s Market and this was a wonderful way to eat it. The dish looked just like your picture. Yeah, you guys are super boring. Janet, what did I tell you about your manners…? 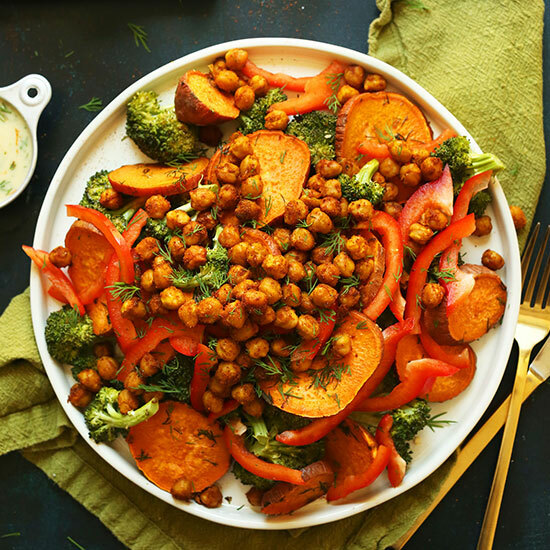 Chickpeas and sweet potatoes are staples in my house and they go well together. This look super delicious. I like the way you eat! As a chickpea and garlic addict: I approve!